Adrian has agreed to lift Mike’s boat out of the wharf basin and store it on the wharf side for the winter where Mike can service it and anti-foul its hull. Trevor installs the 2 12 volt batteries into the RB crane, connects them and starts up the engine. All the batteries are stored in the shed now so that they can be kept regularly charged even when not in use. While Trevor is doing his ‘electrical bit’ Adrian is preparing tools and materials in order to continue wall building. Just as he and Trevor begin actually building Mike arrives and this is temporarily stopped. Mike and Trevor organize heavy strops to lift the boat and get them suitably positioned around the hull whilst Adrian manoeuvers the crane to a place where he can safely reach and lift the boat. With Trevor acting as Lift Master Adrian hoists the boat up and out of the basin, swings the load over the tub boat under construction and lowers it into a space cleared earlier for it. Mike and Trevor strategically place some baulks of wood under the skegs of the boat and Adrian lowers it onto them where it sits very comfortably. The whole exercise is accomplished quickly, easily and safely. Following a cup of tea Trevor and Adrian resume wall building and Mike continues working on his boat. 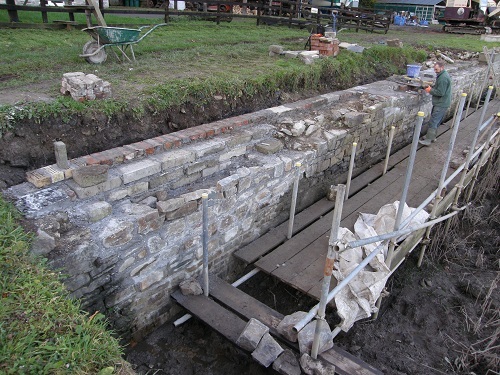 When the point has been reached to call time for the day Trevor and Adrian have brought the back of the wharf wall up to its finished height. Satisfaction is felt by all.